Finally! Chicago is seeing some sunlight & it has inspired me to create a new series of floral paintings. It seems my artwork revolves around the seasons & so it is. My latest 3 paintings are fun, splashy watercolor on canvas with a mix of oil and acrylic and glow in the dark paint. 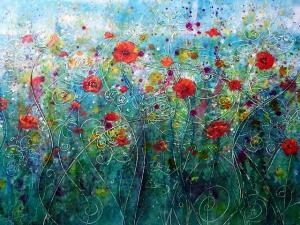 I love my new painting "Spring Patch" so much that Im going to cry when it is purchased! haha! I am just now getting my summer art fair line up scheduled. I have cut down on the number of shows I am doing...mainly because I cannot afford the fees but also because I feel that Chicago is just too over saturated with street fests and art fests to the point that noone is coming out anymore. When there are 3 or 4 shows going during the same weekend, it really cuts into the attendance. I will be participating in a few of my favorites though...Artwalk at the Promenade, Bucktown, etc. Just watch my events lists! I have a couple of traditional oil on canvas commissions that I am finishing up. Once I have those under my belt I want to do some more floral styled paintings. Ive been wanting to paint some tulips pretty badly! OK back to work! Happy Spring!